We’d love your help. Let us know what’s wrong with this preview of Good Books Lately by Ellen Moore. The inside scoop on book groups--from the nation's leading experts! As book group members across the country have discovered, Ellen Moore and Kira Stevens know everything there is to know about book groups, and then some. The founders of the country's first book group consulting company, in Good Books Lately they dish out fun, stimulating advice based on their own experienc The inside scoop on book groups--from the nation's leading experts! If you're looking for new ideas to spice up your book group, wondering how to join an existing group, or hoping to start your own, Good Books Lately will give you the goods to make your book group experience a rousing, rewarding success. To ask other readers questions about Good Books Lately, please sign up. My CurledUp review: The subtitle of Good Books Lately says it all – it is truly a one-stop resource for any reader. Since authors Moore and Stevens are academics and book club consultants, they have successfully blended the two worlds, allowing for an emphasis on book groups but providing plenty of additional info for individuals who want more out of their reading. Starting with a fascinating history of book clubs, from sewing circles to Oprah, Good Books moves on to important and mostly forgotte My CurledUp review: The subtitle of Good Books Lately says it all – it is truly a one-stop resource for any reader. Since authors Moore and Stevens are academics and book club consultants, they have successfully blended the two worlds, allowing for an emphasis on book groups but providing plenty of additional info for individuals who want more out of their reading. Starting with a fascinating history of book clubs, from sewing circles to Oprah, Good Books moves on to important and mostly forgotten terms like “theme”, “plot”, “tone”, “setting”, and the ever-confusing “point-of-view” without being overly academic or condescending. Chapter Two (“Read Yourself Wise: The Art of Intrepid Analytical Reading”) provides an entire Literature 101 course in about thirty pages. Fortunately, Moore and Stevens don’t leave you stranded with an overload of information and continue in Chapter Three to provide insight into the different types of literature we read and how to break down each type. Ultimately we get to the meat of the book, which is how to discuss literature and how to conduct a book group. Unlike other reading guides, (How to Read Literature Like a Professor by Thomas C. Foster comes to mind), Good Books is not academically focused or overly wordy and is geared so that non-English majors can easily understand how to dissect any bit of reading (fiction, nonfiction, classics, short stories, autobiographies, pop literature) and form it into an interesting discussion. With suggestions for how to take turns expressing opinions to playing devil’s advocate when everyone loves the book, Moore and Stevens view literature and book groups from every possible angle. Chapter Seven: “’A Thousand Different Types’: An Assortment of Diverse Distinctive Book Groups” is a great chapter for the voyeuristic type. Comprised of “in their own words” missions, book group bombs and book group favorites from groups around the country, the chapter really gives a feel for what is going on in the world of readers. A great aside entitled “The Personalities in your Book Group: Understanding and Making the Most of Each Individual Reader” is both funny and informative, pigeonholing each member of the group with pseudo-psycho terms like “the idealistic perfectionist,” “the romantic individualist,” and “the playful hedonist,” and even adds a list of “famous” types at the end of each section so you know exactly who you are dealing with (“romantic individualists” include: Michael Jackson, Judy Garland, Virginia Woolf, Bob Dylan, Andy Warhol, Cathy and Heathcliff of Wuthering Heights, Blanche Dubois of "A Streetcar Named Desire"…get the picture?). 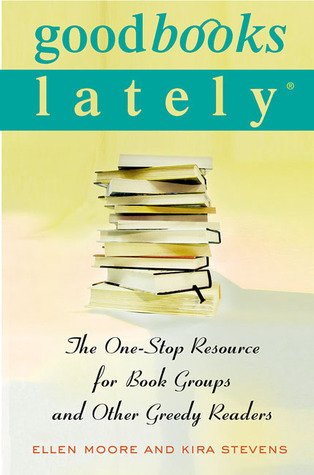 With a book group “troubleshooting” section, a list of suggested book club books, a glossary of literary terms and a selection of resources (including http://goodbookslately.com), Good Books wraps up the complete package with an invitation to participate in ongoing research. I think this was a pretty interesting resource book for readers, particularly those in a book group or interested in joining a book group. I wouldn't say that there was anything earth shattering here but it was a pretty solid book about books and reading. If you're interesting in learning how to lead a book group or how to be a better group member, I'd definitely recommend checking it out. This is a good resource book with some very interesting discussion question ideas. But I got bored trying to read it through. I'm glad I own it, though. And have used several of the ideas in my book discussion groups. I read this book when I was first starting my book club. It proved to be a very valuable resource, with suggestions on how to get the group started, tips for conducting meetings, and ideas about what makes a good book club book. Three years later, I still refer back to it from time to time. The authors founded the first book group consulting company in America and share their knowledge and advice here. They tell how to start a group and keep it going, how to get a discussion going, and how to choose books. Included are some fun booklists. A most "booky" book. This book is veru informative and useful to my thesis on on-line book clubs but it needs to be updated in regards to on-line book clubs but it gives a nice easy to read layout of how to make book clubs work and ideas to make it fun and interesting as well as gives some book recommendations. Many good ideas and lots of useful reference material. A nice guide for book groups. The book suggestions did seem to mirror the book guides they have for sale on their site though.